Lead Expert on a Penetration Testing Team at Kaspersky Lab. 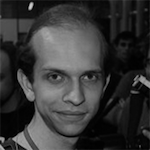 An author of variety of techniques and utilities exploiting vulnerabilities in XML protocols, an author of advisories for various vulnerabilities for major ATM vendors. A speaker at international security conferences: Black Hat Europe and Hack in Paris (presenting the paper on ATM vulnerabilities), Black Hat USA, NoSuchCon Paris, Positive Hack Days, Chaos Communication Congress.